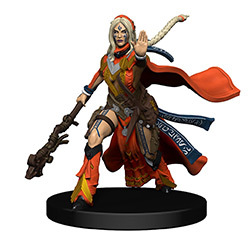 WizKids will release new miniatures as part of the Pathfinder Battles: Playtest Heroes collection in January. The six new miniatures depict famous personalities from the Pathfinder RPG Playtest. The pre-painted set includes Valeros, Human Fighter; Harsk, Dwarf Ranger; Seoni, Human Sorcerer; Fumbus, Goblin Alchemist; Mersiel, Elf Rogue; and Kyra, Human Cleric in dynamic poses.